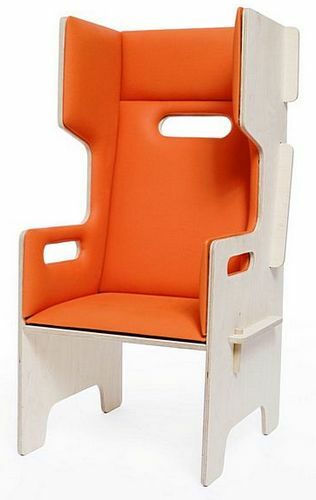 Provide a child-sized haven in a fast-paced world with the superb Grimm2 – a highback chair from Momoll. With four kids, sharing bedrooms and play spaces is pretty much the norm in our house. However I’m very aware that everyone – especially children – needs space and time to themselves. Swiss designer Momoll has created the Grimm2 chair which provides ‘acoustic and visual protection’ for kids who want to take a moment to read or listen to music. The chair is suitable for kids aged three to ten, and features suitably positioned arm and back rests and exchangeable upholstery. It also has carrying handles allowing kids to move the chair where they want. The best part of the Grimm2 is that when it’s not a private nook, it can be tipped or turned to become a hut, airplane, seat or more. Like all Momoll products, the chair is designed to be easily taken apart and slotted back together. It is available in a range of colours and fabrics and iPod speakers can be incorporated on request – cool! While you are visiting Momoll have a look at their new range of wooden animals. 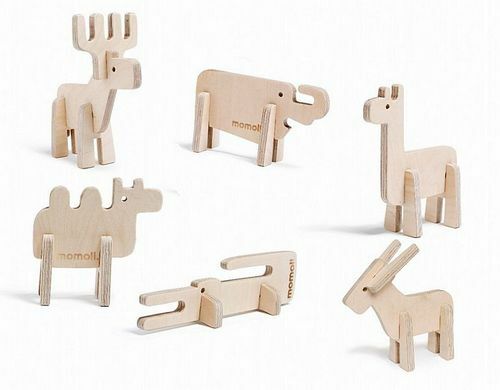 We’ve reviewed Momoll toys in the past and their simplicity together with endless play opportunities continues: the bodies, legs, ears and horns of the animals are interchangeable which gives kids the fun of creating new creatures and coming up with appropriate names. The Grimm2 is CHF598 (Swiss Francs – equivalent to approx $700). Momoll ships to Australia.